Making the switch from gas-powered cars to electric vehicles is neither cheap nor easy, and one limiting factor has been the cost of home charging units. Even the cheapest units cost around $1,000 without installation costs factored in, but the new Powermax EV Charger from Bosch carries a price tag of just $450, and claims to recharged EVs twice as fast as older units.Sounds too good to be true, right? 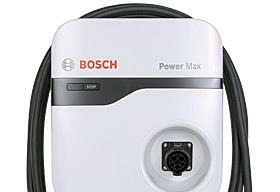 But Bosch has put a lot of time, money, and effort into developing an affordable home EV charger, and the 240-volt Powermax is the fruit of those labors. Available as either a 16 amp model with a 12-foot cord, or a 30 amp version with a 25 foot-long cord, and Bosch says it was able to lower the price by making the charging cords shorter (for those that don’t know, wiring is VERY expensive).While a free home evaluation is available, installation is of course extra. But with EV charging units coming down in cost, there is a good chance that they will start becoming more common place, and perhaps even standard on newer homes. Bosch’s claim that it will charge an EV battery twice as fast other 240-volt Level 2 EV chargers hasn’t been put to the test yet, but that would also make it appealing to the budget EV enthusiast.Will you be adding an EV charger to your home anytime soon?